236 ways to make a text file of your applications folder. In Dumb Question Corner we answer how to install Leopard without iLife, whether Macs last twice as long as Windows PCs, what the heck is Rick Rolling, and how to set options by Podcast. Quick review of Fiwi from wordpower-software.com, more RPN calculator emulators at homepage.mac.com/mba/nsim/ and brouhaha.com and bartosiak.org/nonpareil and nonpareil.brouhaha.com and hp.com. How to set your preferences on YouTube to get high quality video from mydigitallife.info. Ben Fryxell of macmaniapodcast.com does the Honda Bob commercial this week. In this week’s episode of Chit Chat Across the Pond, Bart from bartb.ie and I discuss the latest Windows and OSX security flaws, changing desktop wallpapers to a Flickr account using DeskLickr from http://desklickr.isnot.tv/, and the final step in the great Aperture handoff of 2009. Today is Sunday January 18th, 2009, and this is show number 187. Before we get into tech, I have to tell you about the tires Steve bought me on Saturday. He ordered them from Costco last wee, and this week we went in to pick them up. I about had a heart attack when he told me the price – $1200 for a set of tires! You see, they’re these fancy schmancy low profile tires that match the originals for my car – Mich MXM4 P235/45 R17 rated 93W. Well anyway, we go to buy them and the guy tells Steve they only take American Express, cash, or a check! Well who the heck carries a check nowadays, and why would we have $1200 in our pockets? That would be nuts! And of course we didn’t have AMEX either. I’m hollering at the guy that this would have been good info to give us BEFORE we came to pick them up and Steve’s trying to get me to settle down, when up walks my friend Steve, who hands me $1200 in cash! it was crazy – can you believe he did that? 2 weeks ago Jane asked how she can get a listing of all her applications before she does a clean install. I gave the simple answer of selecting all in her applications folder and pasting into a text editor, and then we learned a LOT more about TextEdit, especially that you could change to plain text before pasting so we could paste in all this cool data. George Harmon suggested we just paste into Excel. I was really embarrassed that I didn’t even THINK of Excel, except when I tried it, I couldn’t paste the text. We have yet to figure this out, but for some reason George can paste into Excel but neither me, nor Jane can. I’m noodling this one. Bear in mind when I say EVERY APP, I do mean every app. It will throw up a load of system apps, and also, if your time machine is connected, all the different versions of apps your time machine is storing, which will be a LOT! I gave Bart’s original command, the find /Applications -name *.app command, and it took quite a while to troll through my apps folder. maybe a minute or more? It found 379 applications in the apps folder AND the Utilities folder within the Applications folder. I looked through the list and saw that it gives a lot of replicate information, so this one is a bit excessive for my tastes, and that’s BEFORE I tried out the dev/null command a try! I started running that one and after about 3 minutes it was only up to the letter T so I got bored and stopped it. He DID warn us that it would be a long list, he wasn’t kidding! This was a team effort – thanks to Jesse and Bart and George and Michelle for all the great ideas – boy Jane, you got us really going on this idea! I loved this though because I learned a lot about fun things to do with Terminal. Fun for a geek at least! I think this is an easy one Mike. When you boot from your installation DVD of Leopard that includes iLife, it goes through six steps. First it does the introduction, then licensing, then destination. The forth step is where you want to be alert and pay attention – it’s called Installation type. You want to make sure you select Custom, and then you’ll see a nice list of the things it plans to install. 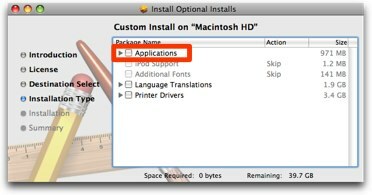 For example, you may not actually need the Swahili language installed, or ALL of the mutant printer drivers it installs automatically. One of the choices will be Applications, and it’s got a little down tick arrow. Click that down and you can then deselect the iLife suite of products. I couldn’t easily get a screenshot of the full install disk with the applications, but I ran the optional installer on my Leopard disk and I put a screenshot of what it would look pretty much like in the shownotes. It’s not exact, but it’s close enough that I think it will help you recognize it when you see it. Good luck and let us know if that worked! Paul’s Question on do Macs last twice as long if they cost twice as much? 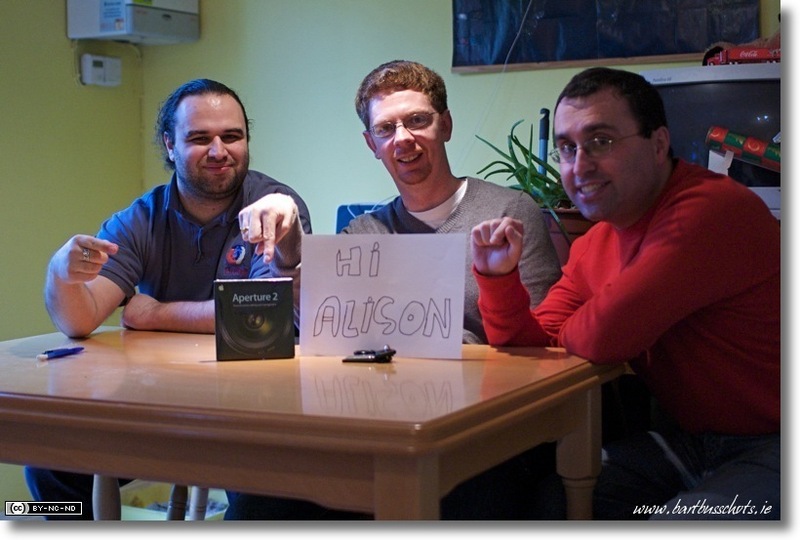 Hi Alison, Greetings from the UK, I have a dumb question for you but I am not sure if you think the answer would be worthy of the podcast. I am a recent switcher to the mac and I have been kicking myself for not making the leap sooner. I was demonstrating how great my Macbook Pro is to a friend hoping he would see the light and make the switch too. My friend is looking for a new laptop right now, he is not very technically minded and wants something that is going to last, and requires little effort to maintain. The question he asked me, and which I am asking you is simple. Macbooks cost about twice as much as similar spec PC laptops, will they last twice as long? To qualify this a little, my friend told me that he needs a new laptop because his pc has gotten so slow over time and little can be done to recover it, apart from reinstall XP and start a fresh. Does the mac have a dreadded ‘registry’ that appears to be the scourge of windows as time goes by. Do macs slow down or do they continue to ‘Just work!’ Thanks for helping a new switcher like myself, I have been overjoyed at the mac community online, I listen every week and it’s like having a new family, I look forward to my podcasts. I’m glad to hear Pauls ay that he’s really enjoying the online Mac community. I used to take this for granted, but I’m starting to wonder if this is unique to the Mac? Surely there are online Windows communities where people just help each other out for the joy of it? I’d like to hear from our many windows listeners on this one! Now to Paul’s question. this gave me pause to think how to answer. I’ll put it a bunch of different ways. Operating System: The Apple OS does not have a registry and therefore nothing to get munged over time. I’ve heard people saying their machines are getting slow because of too much crud, but I load probably a couple of programs a week and I don’t see it happening. There are utilities out there to scrape out old cache and log files though, highly recommended by folks like my friend Steve Stanger of the MacAttack Podcast. I think it’s sort of like cleaning out the gutters of leaves. Again, I’ve never run any of these myself, but when things get weird it’s good to know they’re there. The good news is replacing the OS is a trivial exercise on the Mac, you can replace it and yet keep all your user settings, all your bookmarks, all of your data, and start semi fresh that way. If you enjoy punishing yourself you can do an erase and install, but usually what they call an Archive and Install will do the trick. It’s time consuming, takes maybe an hour or two, but it’s not hard, I’ve never had it booger anything up and it has cleaned up issues. I would say that’s an advantage of the Mac. Another thing about longevity of hardware – Apple has done a fairly good job of dragging old hardware along for the ride. People are today putting Leopard onto very old PowerPC machines from before Apple switched to Intel 3 years ago. Even the lowest end PPC chips handle the newest OS just fine. Compare that to Vista and you can say that Macs “last” longer. We suspect they will be abandoning the PPC machines when Snow Leopard comes out though. Now with Windows 7 it looks like that will change, I’m running it on a very underpowered HP Mini Note netbook and it’s quite snappy, so maybe Windows will catch up here and let you run older hardware in the future. Software: You didn’t ask this question, but in comparing prices it’s important. Apple Macs ship with iLife and many built in applications. On Windows you have to either buy equivalent tools, or know where to find the free versions. iLife includes iMovie, and the lowest equivalent product on Windows is Adobe Premiere Elements for $100. iLife has iPhoto, on Windows you can download Picasa from Google (but you have to go get it). Garageband may not be for everyone, but if making any kind of recording, creating ring tones, etc. is an interest then take that cost into account too. Apple has built in SO many tools that I took for granted till I tried Windows. For example, right click on a folder of photos and you can zip them up into a single archive for sending to someone. Windows you have to go find a tool (7-zip is free and quite good). On the Mac it has a built in application launcher inside Spotlight, you have to go find tools like Launchy to do that on Windows. On OSX if you wanted to burn a DVD as an ISO image, built into OSX, you have to go buy a tool or find a free one online. I am very impressed with the open source imgburn for that. The point is, you can usually find for free online most of the tools that come built into the Mac OS, but if you want things to just be there and work together well, you appreciate the Mac for that. There’s certainly a cost associated with having all this built in, but if you’re not the type who loves to hunt down freeware and shareware, then maybe a Mac would make you happier. Add in the cost of a good anti-virus program as well, to date there are still no viruses in the wild on the Mac. There have been proof of concept ones, and there are a couple of Trojan Horses but they take active participation on the part of the user (entering admin password) and don’t self-replicate like a virus, each person has to go get infected on their own. It’s not to say we WON’T someday have viruses, but today we still don’t. Even after the recent flurry about putting anti-virus on the Mac, none of the sophisticated Mac users I have asked have told me they’re running an anti-virus even now. If your friend wants to buy a machine that they can tinker with to spend time hunting the internet for tools to do what they want to do, and would rather spread the cost out by buying the tools they need over time, and they enjoy running virus scans and defragging their disk and reinstalling the OS, then they should buy windows. If they want a machine that comes with most of what you’ll need, then go for the Mac. it’s been a BIG week for dumb questions – I love it! Next up we have Will who is NOT from the UK. He says, “I have a REALLY dumb question this time: Who, what, when, where, and/or why is a Rickroll? What is its anatomy, habitat, diet, and lifespan, and why does it keep coming up in the Techy crowd? hmmm…how to explain rickrolling? you could look at wikipedia wikipedia.org/wiki/Rick_roll and get a clinical explanation, but to “get” it is harder. 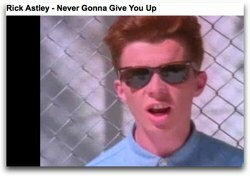 So this guy Rick Astley made this ghastly music video back in the 80s called “Never Gonna Give You Up”. I’m not sure how it happened, but it became a fun thing to trick people into watching it because it’s just so very awful. that’s pretty much all it is. You get told there’s a hot deal on terabyte drives over at buy.com and when you click the link they take you to the Rick Astley video. Or you get news that Steve Jobs changed his mind and is going to Macworld again, but instead it’s a link to Never Gonna Give You Up. It’s basically a practical joke that doesn’t require April Fool’s day. Rickrolling someone is only really fun if they already know about it and you successfully trick them into watching it. Sending someone there who doesn’t know about it sorta flops. There are many who hope this whole thing is over, but I see that there are 14 MILLION views of the video so I’m guessing it might be still going! Here’s a question about iTunes and podcasts. Is it possible to have the already listened to podcasts deleted automatically when you hit refresh ? For my iPod touch it is easy, but for on my laptop not so (so it seems). Maybe I missed an option somewhere, who knows. Disclaimer…I installed Windows 7 😉 But with XP same deal 🙂 Great podcast! Keep them coming! 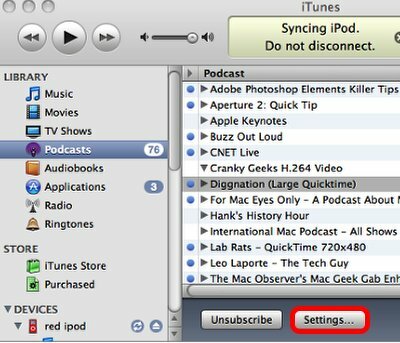 In iTunes 8, can you set a specific sync setting for each individual podcast (i.e. if you don’t want more than 1 episode of one podcast, but you want more episodes of the NosillaCast on the iPhone)? I really don’t know why Apple decides that they think what’s good for one podcast is good for another. It really drives me crazy. Hope you can help, Allison! Oh, and BTW, loved the interview with Blue Mic about the Eyeball! When you plug in your iPod, click on it in the left sidebar, then click on the Podcasts tab. You’ll now see the default settings for all podcasts. in the image in the shownotes I have it set to sync the 5 most recent episodes of the selected episodes. Strangely enough, that’s not where you set the behavior of individual podcasts. You control that in the Podcasts section of iTunes, independent of the iPod. i guess that makes sense since it’s actually the Library your’e controlling not what happens on an individual iPod. On the left sidebar under TV Shows, click on Podcasts. 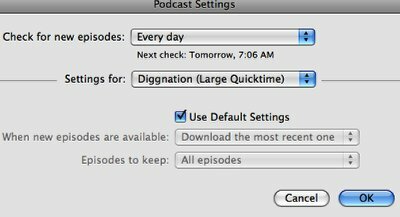 Select a Podcast for which you want to change your default settings. Next, click on Settings… right next to Unsubscribe way down at the bottom. This opens the Podcast Settings button for the specific Podcast you had selected. You have options for how often to check for new episodes, and for when to download them and how many to keep. All Podcasts are set automatically to use the Default Settings, but this is where you can set it differently by Podcast. You can set the behavior for when new episodes are available from download all, download the most recent one, or do nothing. I guess you’d choose "get" manually on an episode if you chose do nothing – might be a good way to manage one’s disk space! You can also choose how many episodes to keep – All episodes, all unplayed episodes, most recent, last 2,3, 4 all the way up to the last 10 episodes. I think this is teriffic because there are some video instruction Podcasts like the ones I watch for Aperture and Photoshop Elements where I want to keep them as reference, but once you’ve seen a Diggnation episode, you’re pretty much done with it. Note that you don’t have to go back and forth selecting Podcasts and then going into the Settings menu over and over again, this menu gives you a pulldown where you can flip between Podcasts easily and set their options. whew – that was a LOT of dumb questions! We’re finally through them. Keep ’em coming, this is one of my favorite parts of doing the show! So when I got the questions on how to get iTunes to let you fine tune how podcasts are managed, and I wanted to document it for René and BJ, what tool do you think I pulled out of my 207 applications to do this? Of course I grabbed ScreenSteps right away. I was able to step through the process quickly hitting the camera on ScreenSteps as I flipped through the steps, setting the camera to a delay when i wanted to catch a pulldown menu, and knowing ScreenSteps was recording everything in nice sequential steps for me. When I’d followed all the steps, I went back to ScreenSteps and annotated the images with sequence numbers, drew boxes around pertinent buttons, and wrote up the text explaining each step. I tagged the lesson in ScreenSteps with a couple of keywords so it would be easy to find later, and then I clicked on Export and saved it as a PDF file in just a few seconds so i could mail it out. Then when it came time for the shownotes, I exported again, this time in html so I could paste it right here to be read on the show and as a reference for later. This one is interesting enough that I think I’ll also export it straight to the blog and have it be a tutorial as a page in the right hand sidebar. In just a few minutes I’m able to make terrific documentation for three different uses, and if any of you find an error, I can quickly change it and export those versions again. As research assistant Niraj would say “easy peasy”! If you would like to have fun with ScreenSteps too, head over to screensteps.com and download the free trial and when you’re hooked enter the coupon code NOSILLA to get 25% off the purchase price! Let’s take a moment to talk about one of the tiniest little applications I’ve ever used that solves such a tiny but annoying problem. I have gone to great effort to not repeat reviews on the NosillaCast that I also send to Tim Verpoorten’s Mac Reviewcast, but I can’t resist telling you about this one here too. So picture this – you have to copy a file from one folder to another. You open a window and find the file. Then you open another window but it covers the other window. In a few seconds you can rearrange the two windows so they’re side by side, and now you can finally drag the file from one to another. Imagine a little app whose whole entire purpose in life is to open two finder windows and arrange them side by side for you. Enter Fiwi from wordpower-software.com. I have to give Mathew credit for this one – he sent it over to me and I sure thought it sounded dumb, I mean how hard is it to move a couple windows around? But think about it – wouldn’t that save you like 16 seconds a day not having to arrange windows when you move files? I should mention that you get your choice of vertical or horizontal windows, so it’s practically feature laden! Mario suggests you drop it in the left sidebar, or the top of a finder window, but it also works with Quicksilver or Spotlight. Fiwi will work for 99 times without paying Mario the developer, but I had a need for it once and I raced over and dropped him the whopping 99¢ he asked for to unlock the software. I did the math – if my time is worth more than 12.5¢ per hour, then Fiwi was worth the dollar I spent. Go check it out! Dr. Rob has heard me chatting away about my love of Reverse Polish Notation calculators over the years, and he hooked me up with new info on my obsession. He sent me an HP41 calculator emulator called nsmim from homepage.mac.com/mba/nsim/, which is a port to the Mac of the original from brouhaha.com. the HP41 has a special place in my heart, Steve and I had a really good friend named Drew who had the 41, in fact he had the 41CV! i know, you’re impressed, right? You see, the 41CV was about $600 when it first came out in the late 70s! Drew got the CV because it had a magnetic card reader – which was one of those things that was so cool we were sure we needed, but of course didn’t actually use. You could store programs on those cards, but the vast memory of the 41 was plenty back then. anyway, as I checked into nsmi, I read along and discovered that it was actually the precursor to the program Nonpareil, which I actually already use for my calculator emulator needs. You can get Nonpareil for the Mac at bartosiak.org/nonpareil and for Windows at nonpareil.brouhaha.com. Go check these out – they’re way fun! Dr. 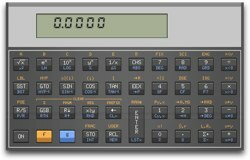 Rob also tipped me off to a cool site where you can view all the HP calculator models still available today, at hp.com in a really complicated url. 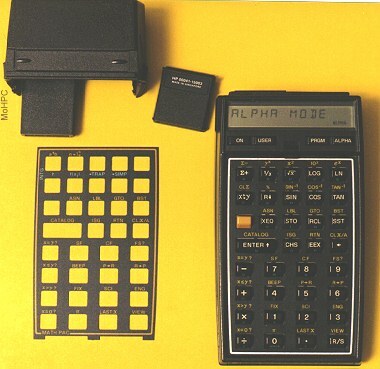 It warmed my heart to see they still have a version of the hp35, which was the first calculator we had in our house – around $400 in 1974, and my dad would let me play with it once in a while, but I still had to use a slide rule during Chemistry class. Maybe that’s why I hated chemistry! In any case, thanks Dr. Rob for the hot links! A while back I declared YouTube dead to me. I did that because the video quality was just so darn awful. I even bothered Elliott of the famous ElliottMediaGroup Mac videos on Youtube to ask him how he encodes his videos because they always look really good. He sent us instructions but they were pretty much what we were already doing. The other day I noticed a while ago that there’s a link at the bottom of the video that said “watch in high quality”. I gave that link a click and suddenly it looks great! Well heck, I went back and watched my own videos with that button and they looked great too! Am I the last person to notice this? Well that got me to thinking, I wonder if there’s a way to make Youtube always give you high quality video instead of having to ask for it. Choose my video quality dynamically based on the current connection speed. I have a slow connection. Never play higher-quality video. I have a fast connection. Always play higher-quality video when it’s available. That last option was my choice but it’s very cool that they give you the option of never seeing hi quality video if you have a slow connection too. Excellent that they give you a choice! mydigitallife.info back on a post in June, they gave the instructions. It’s quite geeky but also quite simple. If you create a video on Youtube, over on the right they give you a big glop of code with the word “embed” next to it. You just copy that glop and paste it into your blog and there it is. To make it high def though, the folks over at My digital Life discovered a string of characters that you sneak into the middle of the glop of embed code. basically it says to add: &ap=%2526fmt%3D18 after the url in both places in the embed code. Yeah, that’s EXACTLY what I was thinking, I just wanted to be sure by checking with them! sheesh, how did they figure that out??? If you really want to do this, follow the link to their site in the shownotes and they walk you through exactly how to do this. Very cool. 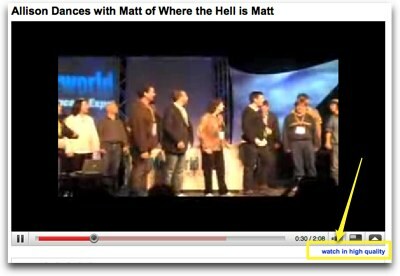 note that when you rewatch me dancing with Matt over and over again from last week’s show, it’s in high def! Ben Fryxell of macmaniapodcast.com does the Honda Bob commercial this week. 1) Another remote arbitrary code execution flaw in Windows – this time on SMB (windows file sharing). Patch released on this week’s Patch Tuesday – update all your Windows machiens and VMs now! How do two people in two countries split the cost of something online, and not pay massive fees for delivery? MacCraic guys Justin Byrne and David Shortle track down Bart in Ireland and hand it to him! Send emails to allison@podfeet.com, follow me on Twitter at twitter.com/podfeet. Thanks for listening, and stay subscribed. Thanks so much for the shoutout- I really appreciate it! The high quality tip is a really good one- I’ve been wondering about how to do that for quite some time! Let me be the first to say that I don’t HATE the Rick Astley song. Ghastly no way!!! LOL It’s totally 80’s, man!! You probably already got other emails about this, but Windows does indeed allow a zip archive to be made by right-clicking on a file or folder, same as OS X. I think it started w/ XP. and I totally loved the CCATP this week. I would like to share my thoughts on the online Windows communities. For the pc user ‘Yahoo Answers’ is a place to get “how to” help on just about any computer related subject. For the geekier mcse types, my favorite place to get help (and to help others) is at the Mark Minasi tech forums. Sometimes google is still the best place to get help especially when you can type in the text of an error message (I know, there is no shortage of those). When I see discussions about how pc’s are getting mucked up and slow I wonder how that is possible, I never have any such problems. It doesn’t take long though for reality to set in, and then I think back to all of my family and friends computers and how much time I spend fixing them! Like last weekend when I fixed a friends computers and my brothers computer too. Hey it’s good for the social life I guess, since some of these friends I would hardly ever see if it wasn’t for Windows. How is that for looking on the bright side? I know this is awfully late, but I feel obligated to correct one point. The HP-41CV didn’t come with a magnetic card reader. No HP-41 came with a magnetic card reader, because the magnetic card reader was an attached accessory that could be used with any HP-41. Also, am I the only person who gets a “Pr Error” crash every time I start up the Nonpariel Mac versions of the HP-11c thru 16c, like the one you have pictured? I find this annoying enough that I don’t use these versions of Nonpariel. Oh heck Mike, you’re not late at all! And you know what, now that you mention it I DO remember it being an add on piece of hardware, I’d forgotten all about that till you said it! And yes, I get that stoopid PrError every time I open Nonpariel. I wrote to the developer after I did this show and told him that’s why I don’t use it either. Actually you first have to turn it on, which is kinda dopey and then you have to hit clear to clear the Pr Error. I don’t use it much any more because that annoys the daylights out of me too. Unfortunately I didn’t hear back from him yet, so for now it gathers a bit of electronic dust. I’m amazed how many HP RPN fans there are out here! Next time I read a blog, Hopefully it does not fail me as much as this particular one. I mean, I know it was my choice to read, however I truly believed you would have something useful to talk about. All I hear is a bunch of crying about something you could fix if you weren’t too busy looking for attention.